They are towering figures, larger-than-life statues that honor heroes of a bygone era. The Confederate leaders memorialized on Richmond's Monument Avenue were once revered, but have become flashpoints in a national debate about how symbols of slavery and white supremacy should be treated today. The angst over what to do with Confederate monuments has been particularly pronounced in Richmond, a onetime capital of the Confederacy. Local artists hope a new exhibit will spark ideas about how to accurately document the city's history while not glorifying Confederate leaders. What Happens to Controversial Statues After They're Removed? Should the statues go to a museum? Destroyed? It's a dilemma that historians are discussing again after the furor over Confederate statues led to violence in Charlottesville and protests elsewhere. News4's Chris Gordon reports. "How do you honor that history of the street while at the same time trying to engage people who come to Richmond and the residents who live here in a meaningful conversation about what they mean today?" said Bill Martin, director of The Valentine museum, where renderings of 20 creative proposals for redesigning the street are now on display. 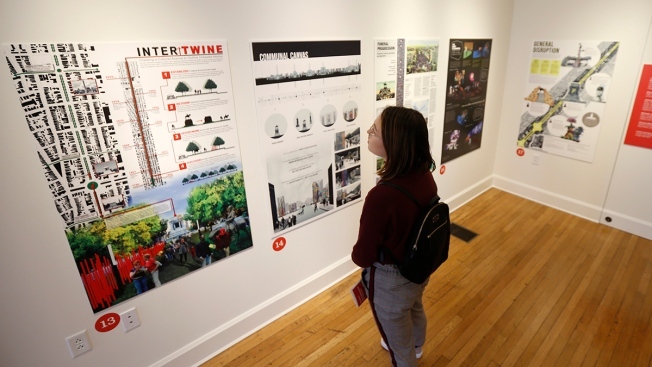 The exhibit grew out of an international design competition that asked architects, planners, designers, and artists to reimagine Monument Avenue, a 5-mile historic urban boulevard where five giant statues of Confederate figures from Virginia stand, including Robert E. Lee, Jefferson Davis, J.E.B. Stuart, Thomas "Stonewall" Jackson and Confederate Naval commander Matthew Fontaine Maury. The contest drew 70 entries from around the world. "Monument Avenue: General Demotion/General Devotion" features the designs chosen as finalists. The proposals, depicted on oversized placards, range from elaborate to humorous. One suggests burying the statues underground and leaving only the heads visible, a design that would eliminate some of the grandeur of the current statues and allow people to see the figures at eye-level or look at them in an underground viewing area. News4's Justin Finch reports at J.E.B. Stuart High School in Falls Church, Virginia. 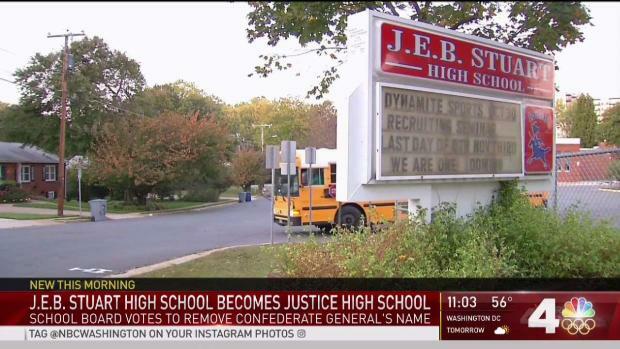 Many students were learning Friday morning about the decision made Thursday night to rename the school. Another depicts the J.E.B. Stuart statue as a garden where overgrown native plants cover Stuart. The Stonewall Jackson statue is shown covered in books —a "temporary-interactive dumping ground" where people can drop off textbooks that depict slavery as a benign institution. Still another calls for replacing all the Confederate statues with light-filled sculptures and pavilions and creating new monuments to commemorate major milestones in the civil rights movement. Organizers acknowledge that none of the proposals will likely be used as a precise blueprint for what to do with the statues. But they are hoping that some of the ideas will spark conversations that could lead to a resolution. The national debate over Civil War symbols erupted in 2015 after white supremacist Dylann Roof fatally shot nine black people at a South Carolina church. 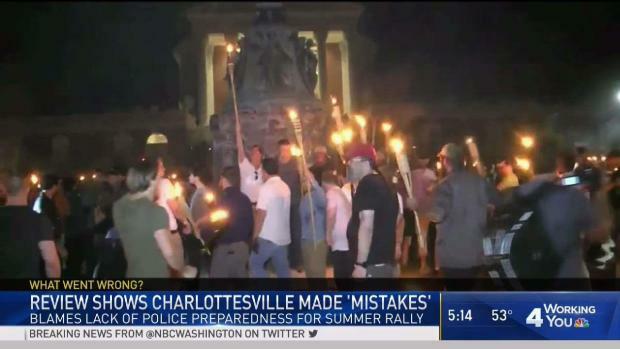 It was reignited in 2017 following a deadly white nationalist protest in Charlottesville. The Southern Poverty Law Center, which has tracked the movement, estimates that 114 Confederate symbols around the country have been removed or renamed since 2015, but another 1,747 remain undisturbed. "I think, and our report makes clear, that the monuments are about white supremacy and they do invite very difficult conversations about our nation's past that some people would rather not have," said Seth Levi, the lead researcher on the center's 2018 report chronicling the Confederate symbols that have been removed and those that remain in place. Non-uniformed police employees, not sworn officers, blocked traffic in Charlottesville during the deadly white nationalist rally. "This wasn't a football game," Tim Heaphy said. "This is an event where people are bent on hurting each other." News4's Derrick Ward takes a look at the findings of an independent analysis of the law enforcement response. In Richmond, a commission has recommended removing the statue of Confederate President Jefferson Davis, adding historical context to the other statues and erecting new monuments to reflect a more complete story of the city's history. The Valentine exhibit opened last month, two weeks after a scandal over a racist yearbook photo and an admission of wearing blackface prompted calls for Gov. Ralph Northam to resign. Northam refused to step down and has promised to use his last three years in office to work toward racial reconciliation. Camden Whitehead, an associate professor in Virginia Commonwealth University's Department of Interior Design, said the exhibit provides a way to pull more people into the conversation about what to do with Confederate statues in a city where nearly half of the population is black. "We have this avenue that's a beautiful place... and yet, it's populated with Confederate statues that are controversial and don't necessarily represent the values of our city," said Whitehead, who helped spearhead the exhibit. 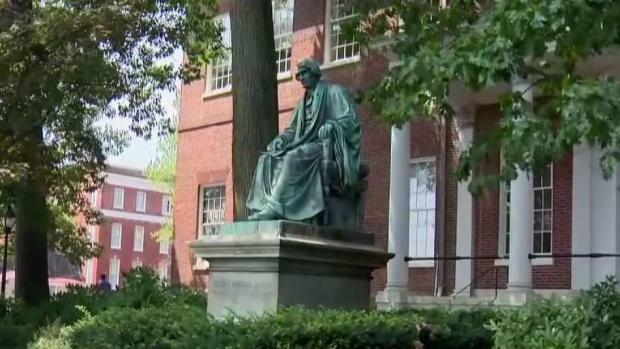 Kristi Mukk, 21, a student at the University of Richmond, said the design proposals show there are many things that could be done beyond just removing the statues or adding plaques for context. "It was interesting for me to see more artistic ways to think about it —changing architecture or the landscape, playing with perspectives of the monuments, whether they're at eye level or not," she said after seeing the exhibit. Last month, Richmond Mayor Levar Stoney appointed members of a new group — the Richmond History and Culture Commission — to evaluate the city's historical sites and provide guidance on the fate of the Monument Avenue statues.